The Vatican has launched an investigation into the funding of its former secretary of state’s apartment restoration. The investigation involves two executives from Rome’s Bambino Gesu Children’s Hospital—former chairman Giuseppe Profiti and former treasurer Massimo Spina—on allegations that they misappropriated hospital funds to pay for the restoration of Cardinal Tarcisio Bertone’s apartment while he was Vatican secretary of state. Greg Burke, deputy director of the Vatican press office, confirmed the probe on March 31. He said Bertone was not under investigation. The latest news came after a report published in the weekly magazine L’Espresso that the two executives were being investigated on allegations they used $455,000 of hospital funds for the restoration of Bertone’s lavish top-floor residence. Italian journalist and author Emiliano Fittipaldi, who writes for the magazine, claimed funds designated for sick children were diverted for the apartment’s restoration through a London-based holding company controlled by Gianantonio Bandera, a friend of Bertone’s. Fittipaldi, author of “Avarice,” and another journalist, Gianluigi Nuzzi, are currently facing charges in the so-called Vatileaks trial for receiving and publishing confidential Vatican documents on the Holy See’s financial excesses in separate books last year. The trial is scheduled to resume Wednesday. After the explosive books were released, Bertone insisted he paid for his apartment renovations with his own money, but he donated $170,000 to the children’s hospital last December. At the time, Bertone said that the funds he paid to the hospital were a voluntary donation, not a reimbursement, and that he felt he had been slandered by some kind of “holy alliance” against him. “It is a donation that reflects my sentimental attachment to the hospital and its little patients,” Bertone said. Bertone, 81, was secretary of state from 2006 to 2013 and briefly in charge of the Holy See and its administration when Pope Benedict XVI resigned in 2013. Two years ago, Italian media reports claimed Bertone had angered Pope Francis with a move to combine and renovate two apartments and create a 6,500-square-foot residence in the San Carlo palace next to the St. Martha Residence where Francis lives. Bertone’s term of office was highly divisive in the Vatican administration, and he was replaced by the current secretary of state, Pietro Parolin, in 2013. 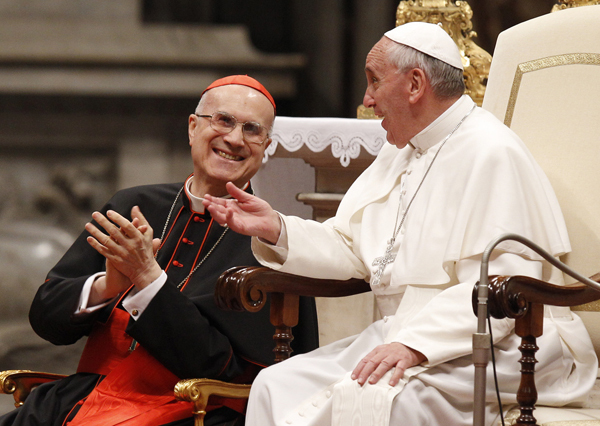 Bertone denied responsibility for the first Vatileaks scandal, in which the pope’s former butler leaked confidential documents to the media exposing divisions within the Curia. Before his removal, the cardinal lashed out, saying he was the victim of “moles and vipers” in the Vatican.